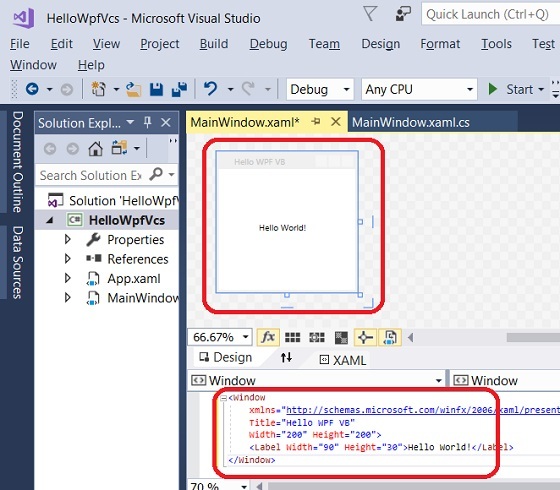 How to build a WPF application with VC# and XAML in Visual Studio 2017? 1. Start Visual Studio 2017 with .NET development environment. 2. Click "File > New > Project" menu. You see the new project box showing up. 5. Click "OK". You see a default application window displayed on the visual design section showing up. 6. Drag the bottom right corner to change the size of the application window. 7. You also see XAML (Extensible Application Markup Language) definition of the blank application in the XAML section. 9. You see the application window changed in the visual design section.